MMHA Member Hawkins Electric Service Honored as Top Family-Owned Business in Greater Washington D.C.
HAWKINS ELECTRIC SERVICE HONORED AS A TOP FAMILY-OWNED BUSINESS IN GREATER WASHINGTON, D.C. Since 1918, successive generations of company leadership have reinforced the core values that founder Jay C. “Pop” Hawkins embraced when he began to install electricity as a new technology in the still-rural Maryland towns located just a few miles from the U.S. Capitol. Brothers Eric Shatzer, President/CEO, and Todd Shatzer, Executive Vice President, are today’s leaders of this regional powerhouse of an electrical contracting firm. Hawkins Electric has grown to be a leading commercial and residential electrical contractor known for its award-winning work on multifamily electrical construction projects. The company’s expansion strategy over the past decade has resulted in a doubling of revenue, tripling of facility space, tripling of the number of employees and multiple industry awards for safety, project and service excellence. Hawkins Electric has a mission not only to provide an impeccable level of technical expertise and service to its customers, but also to serve the community in ways that strengthen people and families. Many thousands of dollars in monetary, material and labor donations have been invested over the years that have made a true difference in many lives. Hawkins Electric is a long-time supporter of Special Olympics (25 years), Stand Up for Kids (15 years) and local first responders (25 years). 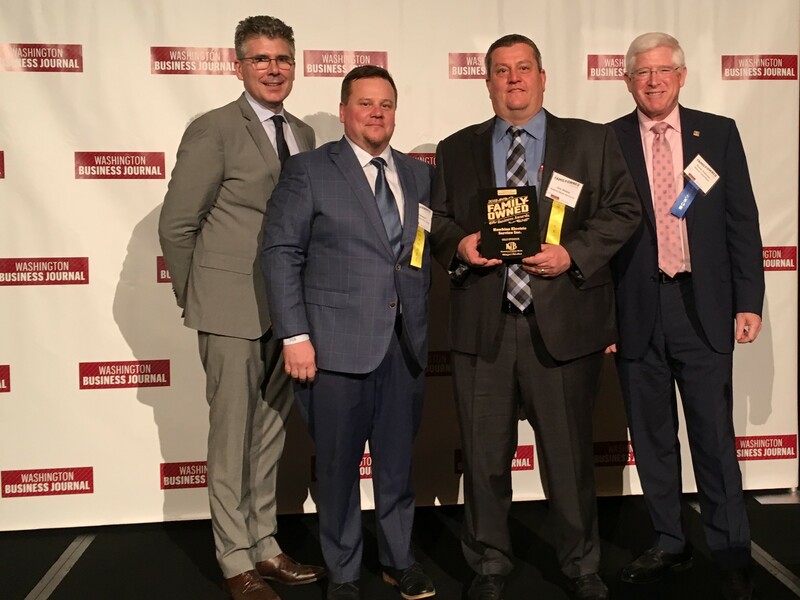 Recipients of the 2018 Washington Business Journal Family-Owned Business Awards were honored at an event on March 1, 2018 at the Four Seasons Hotel in Washington, D.C.
Hawkins Electric Service, Inc. is celebrating 100 years of providing the finest electrical installation, construction and preventative maintenance services to the Washington, D.C.-Baltimore-Northern Virginia metropolitan region. Project types include multifamily construction and service, commercial construction and service, residential installation and service, and commercial green energy technology. Since 1918, the Hawkins Electric team has built a foundation for repeat business through technical excellence, outstanding customer service and the commitment to always do the right thing. Eric Shatzer, president and CEO of Hawkins Electric Service (second from right) and his brother Todd Shatzer, Hawkins’ executive vice president (second from left), accept the Washington Business Journal’s 2018 Family-Owned Business Award from publisher James McGregor (far left) and awards program sponsor Randy Anderson of National Capital Bank (far right). Hawkins Electric is one of 15 companies in Greater Washington, DC honored in this year’s third annual awards competition. Hawkins Electric Service has been a member of MMHA since 2016.